Are Peanuts Good for You? 1 How do I know if I have peanut allergy? 2 Is it safe to give peanuts to kids? With unknown reason, the number of cases of peanut allergy has doubled within the last decade. So you might wonder: are peanuts good for you? Actually, as good sources of protein, peanuts contain many nutrients like fiber, niacin, folate, vitamin E and MUFA. Peanuts and peanut butter contain a substance called as resveratrol. It functions as an antioxidant in the body. Peanuts are good for the heart as well. If you do not have peanut allergy, why not include such a healthy food to your diet? In this section we will look at various benefits of peanuts and find answer to the question: are peanuts good for you? Peanuts are rich in nutrients: Peanuts contain high protein content as compared to other nuts, as they are legumes and not actually nuts. The quality of proteins present in peanuts is also more complete. Peanuts contain folate which prevents birth defects, helps in strengthening bones and gives protection from cancer and heart ailments. Peanuts also contain a substantial amount of Vitamin E.
Peanuts contain unique antioxidants: Resveratrol is an antioxidant which is usually found in wine and grape juice. Next to them, peanuts are the richest source of this antioxidant. The content of resveratrol is ten times of roasted peanuts or peanut butter. Peanuts good source of Phytosterols: Phytosterol helps in maintaining healthy heart and also decreases the cholesterol levels. Research has shown that phytosterol might also be helpful in fighting cancer. Some studies have found evidence that peanut intake can be correlated to reduced risk of colon cancer. Peanuts can aid weight loss: Peanut butter gives around 180-200 calories per serving and hence does not seem to be a diet food. However, it also contains almost 2 grams of fiber and 8 grams of protein per serving. This makes it a very filling food, and we tend to eat less. Since it is an indulgent food – eaten in moderation - it reduces craving. Peanuts have the good fat: The fats present in peanuts are MUFAs (monounsaturated fatty acids) which are considered healthy for the heart. When insulin resistant individuals consume diet with high MUFA content, they have lower level of belly fat. This was in comparison to people who consumed high fat and carbohydrate diet. Also, it is advisable to not opt for low fat peanut butter, as the other ingredients make up for the reduced fat content. So in a word, are peanuts good for you? Are peanuts healthy? Indeed they are! 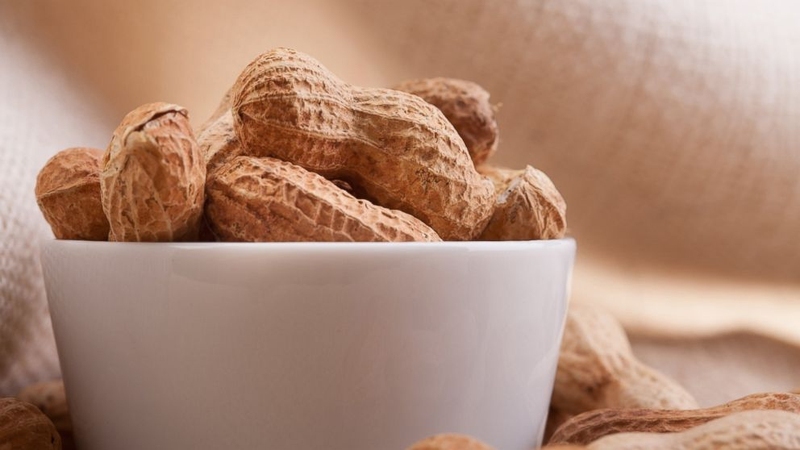 Although we have figured out the question: are peanuts good for you, there are still some precautions that need to be taken before you take peanuts. How do I know if I have peanut allergy? Peanut allergy is fairly common and the reactions are triggered within a few minutes when you come in contact with them. The symptoms can be categorized into mild, obvious and serious symptoms. Mild symptoms: Itchy skin, nausea, an itchy feeling or tingling in the mouth or around the throat, hives which can be small spots or large welts, congested or runny nose. Obvious symptoms: These symptoms can be unpleasant or violent, however, might not be considered as serious health risks. Some of them are: nausea followed by breathlessness, vomiting, diarrhea, abdominal cramping and swelling in the lips, tongue, face or limbs. People tend to panic when such symptoms occur. If you have some of these serious symptoms, you need to be treated immediately. Is it safe to give peanuts to kids? Are peanuts good for you? You may ask it with more concern before you give it to your kids. This is because of the allergies they can cause. Peanuts should be avoided till 9 months of age. Some women are asked to avoid peanuts during pregnancy and lactation, however, it does not assure that kids will not get peanut allergy. Children who are given peanuts earlier in life tend to have less allergies. Doctors can be consulted when you are in doubt, but if diagnosis hasn't been made, they should not be avoided.